Excellent local tour guide with driver in new benz made this visit. Excellent local tour guide with driver in new benz made this visit. Two days non stop touring - but again, what a busy city with 10 cruise ships in town as they flood the venues. But worth every minute. Go to Hermitage EARLY. An interesting place to visit … once. An interesting place to visit … once. To be honest, amber might be a preciously limited commodity, but it&apos;s a bit like visiting a room made of lint balls. Impressive! I love Amber. I would like to sit there alone and read a book. Or have tea. Fantastic, unbelievable city and architecture and historical sites! I have to give the ship&apos;s tours an A+ here. Excellent tour group. Fluent in English, very small groups = 4 day one, 6 day two. Hit all the hightlights. Sadly unable to take photos in the amber room even without a flash! Full on two days, didn&apos;t have enough time to do the city justice but what we did fit in was out of this world. Alla Tours had limited groups of 16 people. The crowds were huge since there were 7 large and two medium size cruise ships in port at the same time. Our tour group was only 12, so we were able to keep together and make our way through the Palace without losing anybody. we booked an independent tour operator.. This was an almost perfect tour. Glad we saw this- no photos allowed though. There was a problem with our e-tickets, so although we got to Catherine&apos;s Palace early, we had to wait about an hour until we got in. Once inside, the palace was crowded and we were rushed though the rooms. Words can&apos;t describe this room, simply magnificent. Very impressive. Our tour got in before the public tours. This made it so much nicer as there were lots of crowds when we left. We&apos;d seen the history of this room on TV and were really anxious to see it in person. We&apos;d seen the history of this room on TV and were really anxious to see it in person. It didn&apos;t disappoint. The skill needed to carve this room is exceptional; it&apos;s hard to take it all in. Gorgeous. This was part of the two day excursion package we booked for St Petersburg. This was part of the two day excursion package we booked for St Petersburg. All the major sights are absolutely packed with people so don&apos;t expect to spend a lot of time standing and admiring the artifacts. Really boring, unless you like spending over an hour looking at jewelry. Just expect crowds at the places during the day.... the Hermitage and the Winter Palace was AMAZING at night on a private tour with Holland America.. the only way to really view anything up close. Best ever guide....Val....every efficient and very personable and enthusiastic. 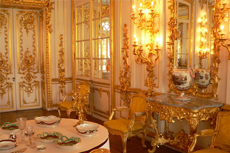 I was in awe of the beauty of the amber room.